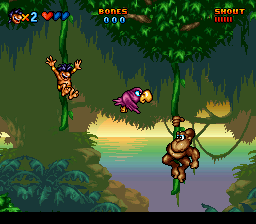 Ever play an obscure-ish game for a little bit and walk away feeling like you had just unearthed a hidden gem? Then for whatever reason that game gets lost in the shuffle. You always mean to come back to it, but somehow you never do. Until you do. And you stick with it a little longer the second time around. Then it suddenly dawns on you that the game isn’t a hidden gem at all but rather, it’s a disappointing effort that could have been (really) good with a little more polish. But I’m getting ahead of myself, so let’s rewind a bit and start from the beginning. 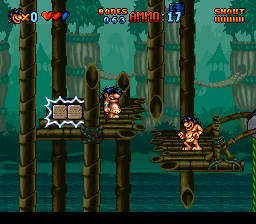 The first game I bought to ignite my SNES resurgence (January 17, 2006) was Power Moves. And fittingly so, it was the first game I reviewed on RVGFanatic.com exactly one year later (January 17, 2007). 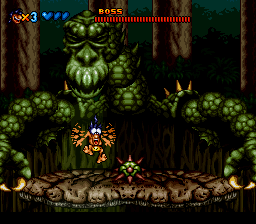 With this WordPress being sort of RVG’s second coming, it’d only be appropriate to kick off the SNES reviews here with the second SNES game I purchased just seconds right after winning Power Moves. 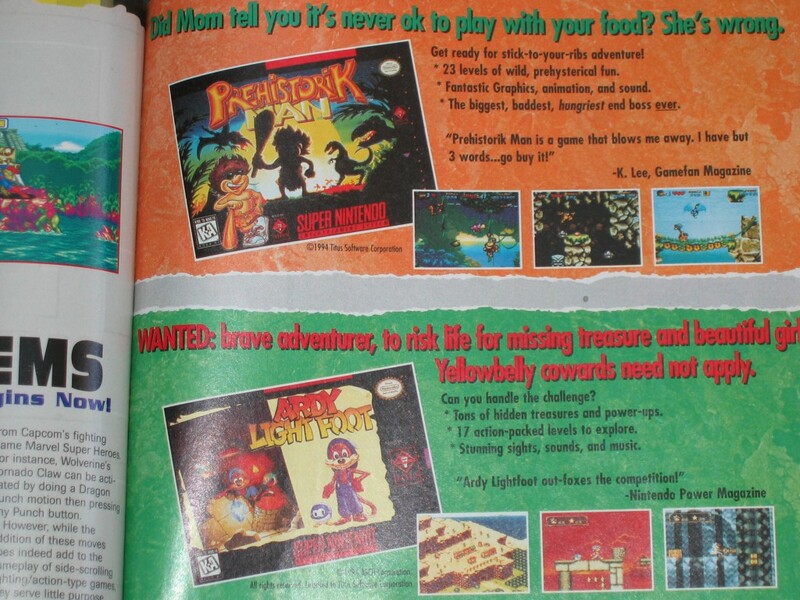 The same seller was selling an obscure little platformer called Prehistorik Man. 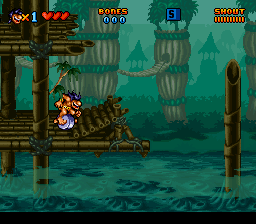 It was one of those games I remember seeing in EGM, being oddly curious about, but never played. 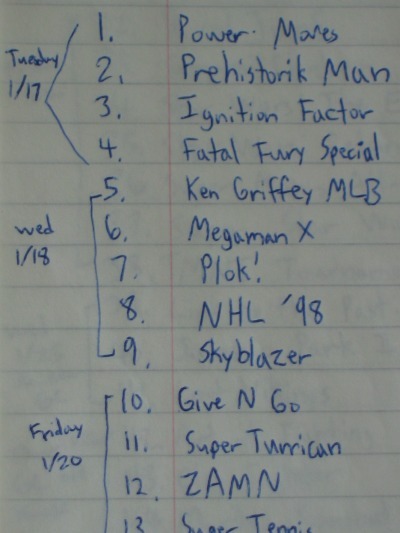 By the time it came out (early ’96, although some reports cite mid ’95), gaming took a bit of a backseat in my life as middle school loomed front and center. So faced with the opportunity at gaming redemption, there was only one thing left to do. I began counting down the days until I could quell this childhood curiosity. 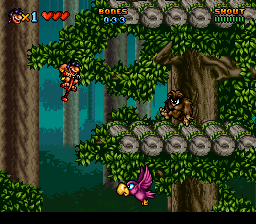 One of my primary reasons for getting back into the SNES was my burning desire to play platformers. 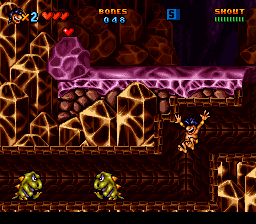 When I think SNES, “platformers galore” is one of the first things that, er, jumps [Oh dear -Ed.] to mind. 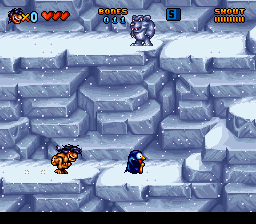 And if Power Moves represented another main factor for why I got back into all things Super Nintendo (i.e. 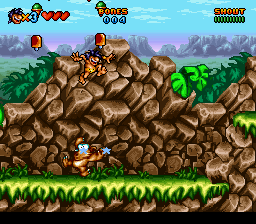 nostalgia), then Prehistorik Man was a shining example of the other factor: a desire to play the games I missed out on back in the day. So it was fitting that these were the first two game purchases of my SNES resurrection. 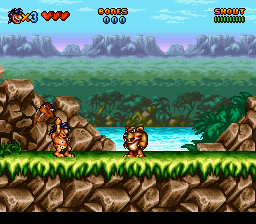 A game I have fond childhood memories of, and a game that more or less “got away” from me. It was the perfect blend of revisiting my past while rectifying the errors of my youth. 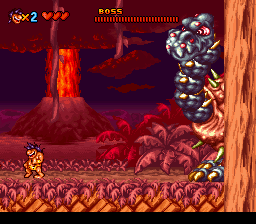 Firing up Prehistorik Man, the game opens up well enough. 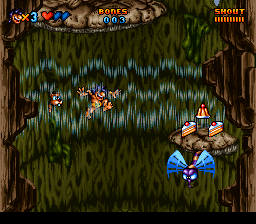 It blasted me with that unmistakably bright and bold mid-’90s SNES look. Like a Saturday morning cartoon bursting at the seams, I was instantly impressed and won over. I couldn’t wait to maneuver Sam around this colorful world of hop and bop bliss. 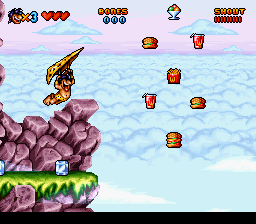 Vintage mid-’90s SNES era visuals! Sam’s club [I see what you did there -Ed.] strikes hard and fast. 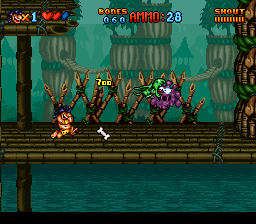 Bonus points for the swing radius as you can take out enemies coming from even behind you. Barry Bonds has nothing on this caveman critter. Speak softly and carry a big stick Sam does. Except, he doesn’t… speak softly, that is. It’s quite the useful tactic, you see. Especially when the enemies grow in strength and quantity. They come at you pretty fast and soon the club becomes less and less effective. 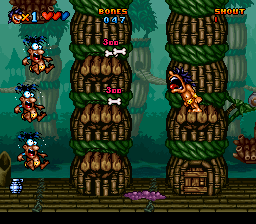 Luckily, Sam’s super scream doesn’t take precious health points away, like it would in a beat ‘em up. 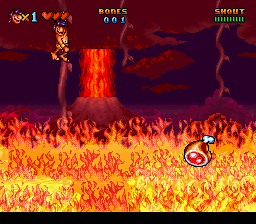 Good thing this is a platformer then! 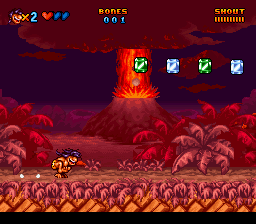 Here you have a scream bar that gradually builds up each time you’ve used your super shout. It’s nice that Titus gave this to us as sort of a “free” special move if you will. You just got to be careful when and where you use it, though. There are times where spiders swing back and forth. And the only way to advance is to hop on them to catch a ride. Use the Starscream and you’ve killed your only ticket. But thankfully, Prehistorik Man does the whole Mega Man “move off screen and enemies will respawn” trick. Super useful. But, also, super annoying in any other area but. A classic tale of the ol’ double edged sword, no? Titus had some neat tricks up their sleeves. In addition to clubbing enemies into oblivion, they also gave you the choice of the good ole hop and bop. Now, one hop can send Sam soaring into the air. This allows you, the cunning and skilled player, the opportunity to collect otherwise unreachable goodies for extra bonus points. 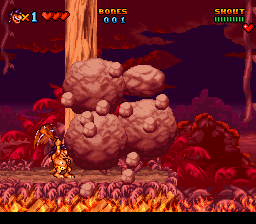 Or, hop on an enemy a few times consecutively and you’ll kill them but ALSO earn bones. 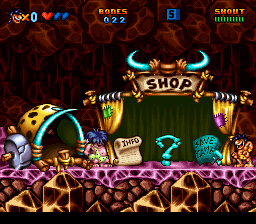 The bones collected will allow you to enter the shop scattered throughout the levels to buy clues, continues and more. So you can go for the straight clubbing kill, which requires little skill, or you can go for the more tricky multiple hop kill which rewards you with bones for the shop system they’ve set up (pardon the pun). This allows sort of a differentiated level of play for novices and experts, and is a pretty cool little system. Do you see that “save game” option above? You might have to squint and lean in real close, or simply zoom in if you’re browsing on your smart phone or tablet. For all the neat little things this game does, it botches it with some truly idiotic blunders. Take for example this whole “save game” BS. You pay your hard earned bones to save the game but guess what, as soon as you turn the system off, the save game is null and void. So what’s the whole point of this option at all? It makes no sense, and really puts a damper on the whole game. Worst of all, there is no password system. It sure could have used one being that it’s 23 levels long. 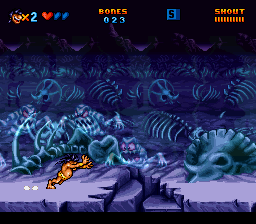 Granted, the levels aren’t long, and some are incredibly short, but 23 is still a lot. … the level select cheat! So, in a weird way, that whole null and void thing on the save system is now null and void (again) thanks to this handy cheat. Damnit Titus, what the hell were you doing?! [That’s what Vince McMahon said… -Ed.]. At any rate, at least Titus made up for it with this cheat. Sam isn’t alone in his quest. Along the way you’ll meet various NPCs that engage you in entertaining ways. 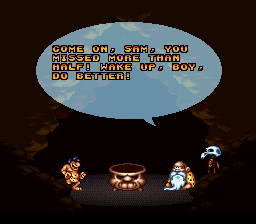 I like the game’s sense of humor and the elder in particular is vintage “GIT OFF MAH LAWN!” material. Er, if cavemen had lawns. Ah you know what the hell I meant! In addition to NPCs, Prehistorik Man attemtps to break up the mundane by incorporating various transportational devices. Quite frankly, they’re tough to master and have a somewhat steep learning curve. I consider myself to be a pretty decent platforming player, but these rides took me some time to figure out, and even then I felt like I was dying more than I should have. In other words, the control on these sections feel a bit finicky and feel like they could (and will) betray you at the drop of a hat. It’s too bad because I do like the idea of them, but they lack the polish of a primo platformer. Hence why I think for all the good this game does, it still ends up in the middle of the pack. In addition to the various rides, Sam can pick up assorted weapons. Some of them even serve multiple purposes, which is something I always love and appreciate. Well, ALMOST always. There’s one infuriatingly maddening level in this game (actually, there’s more than a few) that I have not been able to bypass sans cheat code. The spear seems like a cool weapon at first. Unfortunately, the execution is terrible. It cuts through multiple enemies in a single fling. COOL. It can also pierce itself into surfaces which allows you to jump to higher ground. Again, COOL. 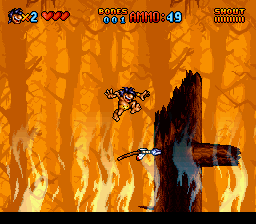 But at the end of this blasted level, you come to a humongous tree that requires you to throw a spear and jump on, rinse and repeat. I can do it about 4-5 times consecutively but I can never reach the top. Either the spear gives way or my button push to jump doesn’t register in time. It’s way harder than it needs to be. It was symbolic. I kept falling and each time it felt like Titus was laughing in my face. Just like how they added that stupid save system but when you turn the game off it no longer saves! Seriously, screw you, Titus. Bunch of gawd damn assholes! Nothing like a screen-filling boss! 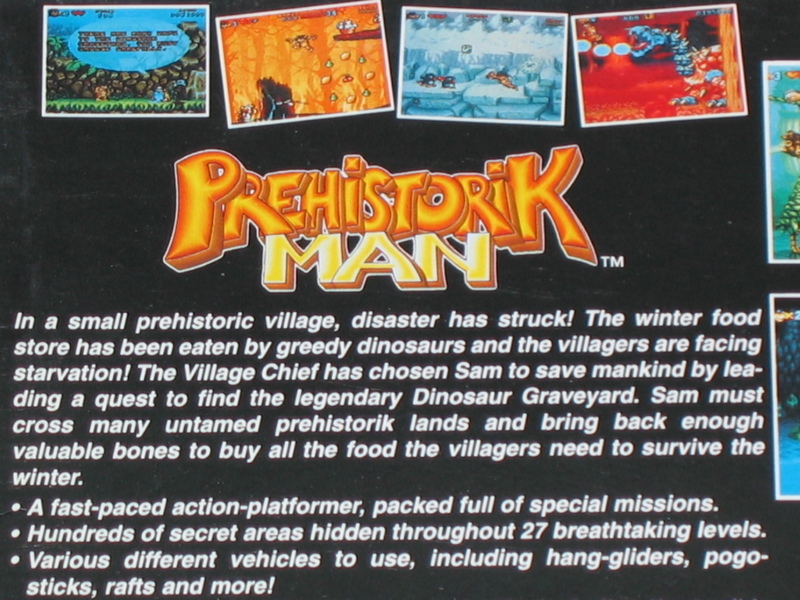 Prehistorik Man is one of those games that wows you early on, but regresses as you progress. 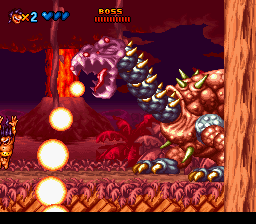 After the impressive multi-jointed dino boss, you enter “Slime World” (Todd’s rolling in his grave somewhere in 16-bit purgatory). 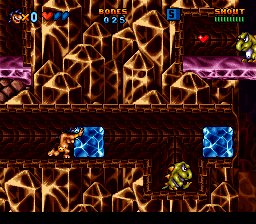 These slime themed stages (whose only correlation to slime has to do with the few blobs that exist in these lame levels) are horribly designed and unappealing, both to look at and to play. 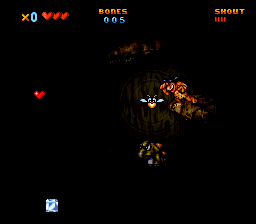 There’s way too many blind jumps and too many instant death pits. 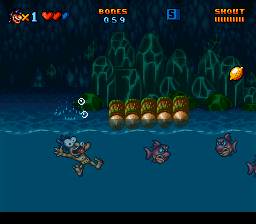 Sure, you can move the camera around a bit like in Super Mario World, but SMW didn’t have the weird herky-jerky scrolling and slippery controls that plague Prehistorik Man. These aspects adversely affect the game. I do like the fact that some of the levels involve certain goals other than survive and advance to the exit at the far right. But when these goals include narrow ledges in far off places and sometimes require blind leaps of faith to find them… it becomes very annoying very fast. 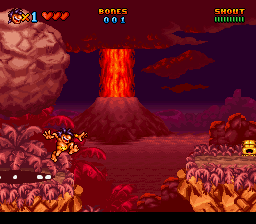 But just when you think the game becomes a bit too unbearable, we thankfully see a return of better stage design. Use the draft to propel you upwards. 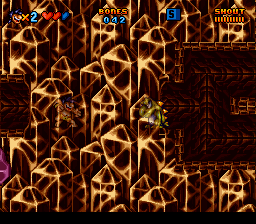 Windy Well from Donkey Kong Country 2, anyone? 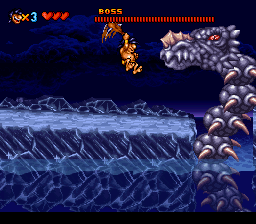 Love the boss designs. Hate the fights. Cheap hits galore and the health discrepancy is ridiculous! 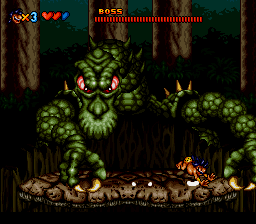 It should be noted that the bosses in this game will give you nightmares. They are way too hard. Especially when you only have 3-5 hearts to work with while their energy bars stretch from California to New York. Add in the slightly too slippery control and you have a bad combo. Ever heard of a Tic Tac before? EGM rated it 9.0, 9.0, 9.0 and 8.5. 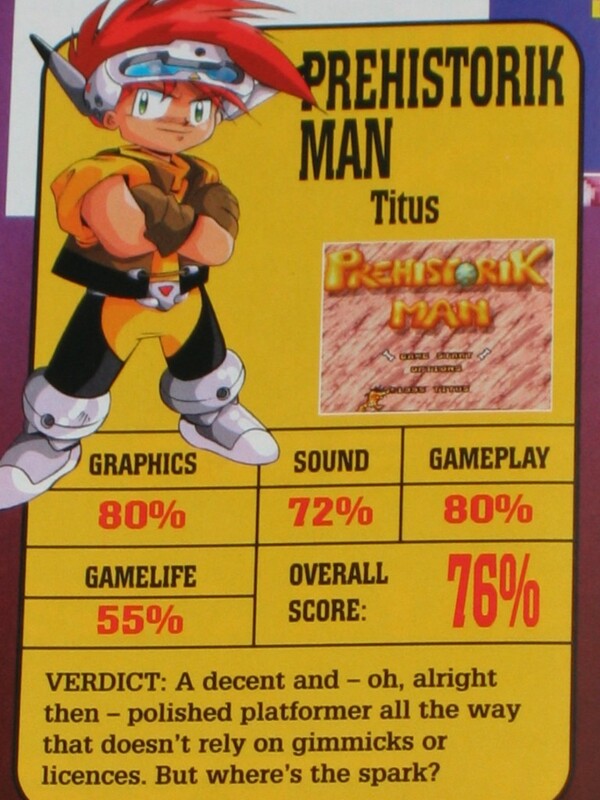 It did well with the critics in North America, anyhow. Good old Super Play though, like the tough loving father that they were, didn’t quite agree with our friends at EGM and GameFan. They gave the game a 76%. 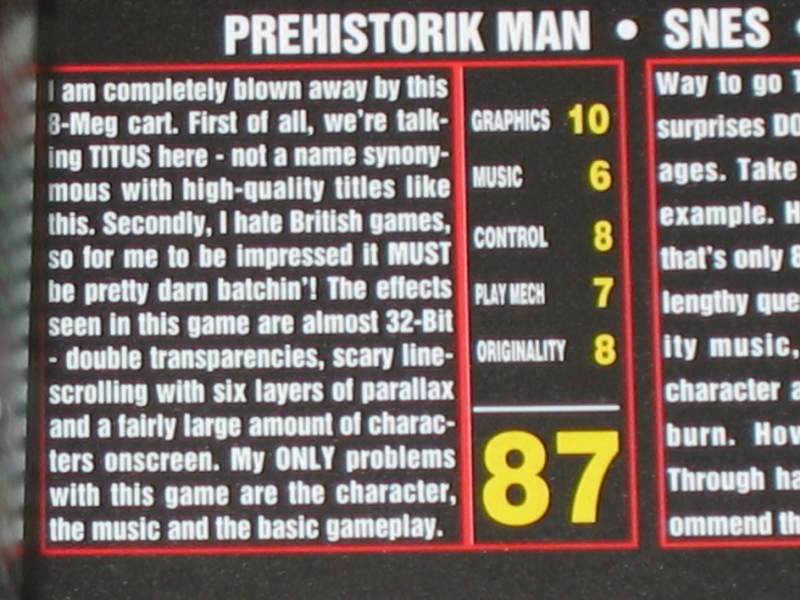 Initially, when I first played Prehistorik Man in early 2006, I fell in love with it after 15 minutes and thought of it as an “8.5” game. I recently sat down with it 10 years later to finally THOROUGHLY play it. The more I played it, the more disappointed I became. It’s certainly not a BAD game by any stretch. But it’s a prime example of a game that sort of wows you early on, but can’t maintain or build on the early momentum of the game. Few things are more disappointing in a video game than that. Still, there’s some value to be had here. On a side note, as of this writing it doesn’t seem to go for very much. It’s not very common as it came out later in the system’s lifespan. If you consider yourself a fan of the genre then I recommend picking up a copy now while you still can for $20. It wouldn’t shock me one iota if this commands $50+ one day soon. 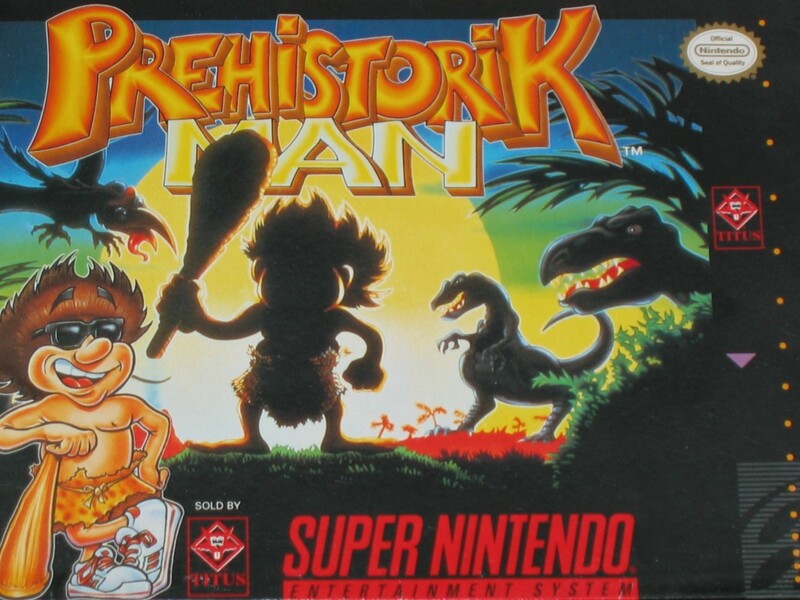 With a little more polish, Prehistorik Man could have very well been a hidden gem. I used to think it was until I sat down to play it longer than 15 minutes. 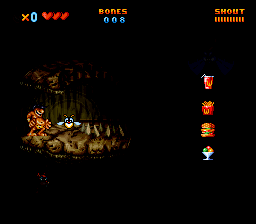 For the past decade I kept wondering why no one ever mentions it in “SNES hidden gem” threads. Now I know why. It’s one of those games that upon initial play tricks you into believing it’s better than it is, but press on and the flaws soon become readily apparent. The game has amazing visuals. Well, for the most part at least. I’m not crazy about those bland looking “slime” stages. 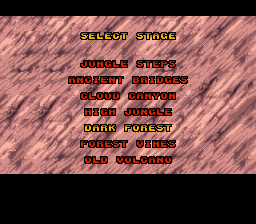 But the other stages are vintage SNES era stuff. 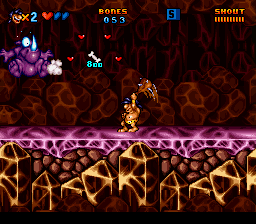 The sound effects can be annoying, particularly the grunts. And the music is very forgettable. So much so that the GameFan review (see above) went out of its way to mention it. And as you may know, GameFan rarely complained about music as they tended to overhype EVERYTHING. So it just goes to show you how forgettable the music in this game is. 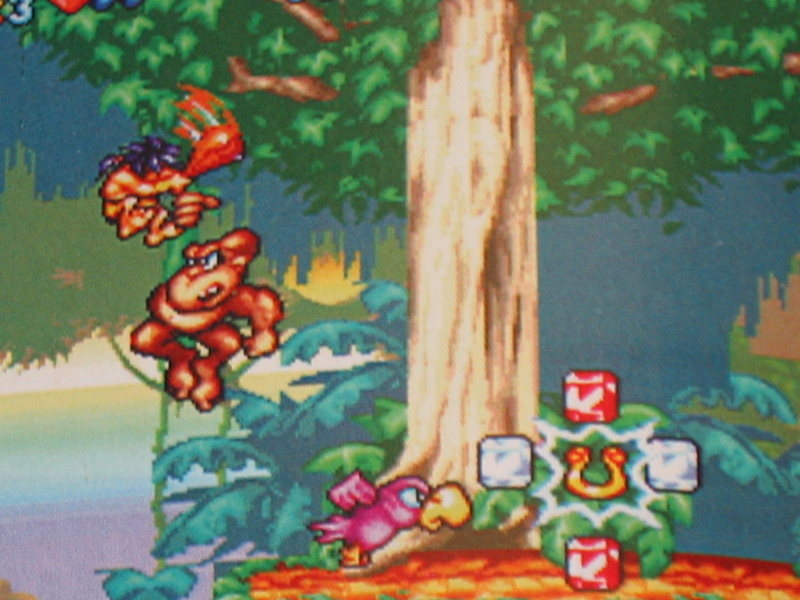 The gameplay is hit and miss which leads to a very uneven playing experience. Sometimes it will delight while more times it’s likely to infuriate. There’s enough good to make it worth your while but it’s also plagued by enough bad that only fans of the genre should seek it out. Previous Previous post: 10 Year Anniversaries!